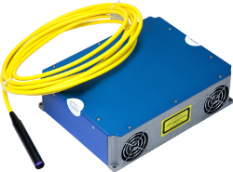 The ISRUZ is a compact CW fibre laser delivering up to 40 W of output power in standard versions and up to 20 W output power in its polarisation maintaining versions, through a near diffraction limited beam. The excellent beam quality and power stability make this fibre laser a multi-purpose tool. The patented “Injection Technology” allows highly reliable broad area laser diode pumps to be used, for cost-effective and maintenance-free operation. The all fibre design guarantees the robustness of the laser, without any optical parts to align or to stabilise. installation service. Two formats are offered: OEM modules or rack mount. The ISRUZ is the ideal solution for a broad range of industrial, medical and scientific applications.